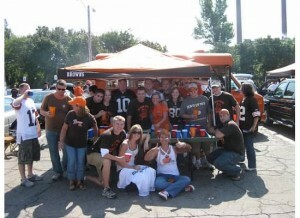 Whatever you do, DO NOT stand up to cheer a touchdown if you attend a Browns game and sit in the Dawg Pound this year. That will simply not be tolerated. That is exactly what happened to me and my wife last Friday night at the preseason game against the Eagles. We stood up, and got tossed. We were not drunk, were not belligerent, and we were not swearing or causing a disturbance to any fans around us. The Cleveland Browns were once known for having the most rabid, loyal fans in the NFL. Apparently the team has decided that they would like to reign in that enthusiasm when it comes to the area of standing up to cheer during a touchdown at Cleveland Browns Stadium. So much so, that it will get you ejected without warning, along with a threat of further action including the revoking of your season tickets. Here’s how it went down. Late in the third quarter we decided to move over one section to sit next to a friend of ours. His section was 90% vacant as the score was 24-3 and as ugly as most games we attend. That’s when Colt McCoy got the team within striking distance of the endzone nearest us and our friend stood up to cheer. Immediately, a fan 5 rows back started angrily yelling at him to “Sit down” (Side Note: It was very much in the tone of an old man yelling ‘get off my lawn’). Keep in mind the Browns were in the redzone about to score our first touchdown so our friend did not sit down, along with most everyone else in the stadium. That’s when the fan angrily confronted our friend about standing. Our friend did not say a word, but just kept on cheering the Browns as they were about to score. The angry fan immediately went and got an usher to report his ‘outrageous’ behavior. The usher came up to our seats and told our friend “you know why I’m here don’t you?” and left. Me and wife had not stood up at this point, and the usher didn’t say anything to us. Then the Browns scored a touchdown, so we all stood up to cheer and high five each other. Big mistake. Immediately, three police officers and 2-3 Tenable security guards came up to our seats to kick us out (all of us! ), telling us that we had already been warned and that ‘fans’ had complained. Never mind the fact that the entire stadium was now standing. Apparently the 3 of us were not permitted to stand up for any reason for the remainder of the game, and since we did during a touchdown, that was enough to warrant an ejection. The total elapsed time from the time the angry fan yelled “sit down!” until the time we were ejected was less than five minutes. My wife (who was the last to stand after the TD) was standing for a grand total of less than two minutes when she was ejected. Somehow in that time, all three of us were determined to have been standing ‘excessively’. Never mind the fact that most people go to sporting events and, you know, stand up and cheer. Crazy stuff for sure. They escorted us out of our section and in the tunnel where they proceeded to confiscate our tickets and made us hand over our IDs so they could write up an incident report. The entire section was booing the fact that we were being ejected. We could not understand why we were being kicked out for standing up to cheer after the touchdown celebration. We tried to argue our point, but were simply told that we were warned for standing (which we were not) so now we were being ejected from the stadium. The three police officers charged with writing the “Fan Misconduct Report” seem to acknowledge the ridiculous nature of our offense, but warned us that it would get turned in to the Browns and they could take further action including REVOKING MY SEASON TICKETS! All this for standing during a touchdown in a preseason game. I should mention that in return for being cooperative, they told us they would not turn in the misconduct report, but that remains to be seen. 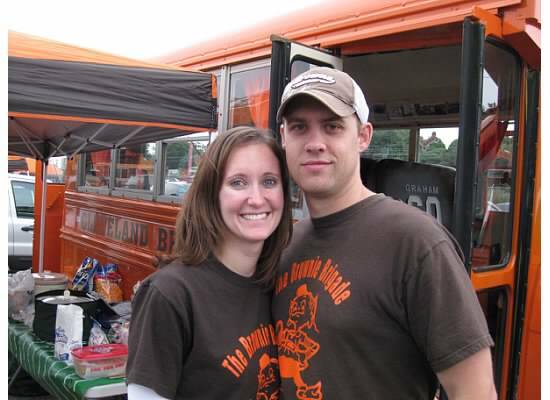 I would like to mention a few things about my level of Browns loyalty. I have been Browns fan since I was 3 and my grandfather told me that we ‘root for the team in the Orange helmets’. I have been a season ticket hold for 10 years. 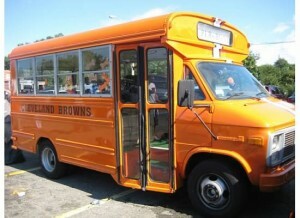 I have owned a Browns Tailgating bus for 4 years. My finished basement is painted like a Browns helmet from floor to ceiling. The first item that I purchased for my then-unborn son last year was a Browns outfit with matching pacifier. I have followed the Browns around the country to 9 other NFL stadiums (and they even won twice!). I own more jerseys than I would like to admit (8), and despite their 47-97 record during my tenure as a season ticket holder, I rarely miss a home game and I never boo the home team. We are the fans that every NFL team wants their stadiums full of on Sundays. Willing to shell out tons of money win or lose (but in our case most lose), and never cause a disturbance to those around us. I have endured a lot as a Browns fan: the fumble, the drive, the move to Baltimore, the countless head coaches and regime changes, the bust draft picks, and losing seasons, but always remanded optimistic and always defended my Browns. In only mention this because being escorted out of the stadium I so dearly cherished, made me vow that if they take my season tickets away for standing up to cheer the Browns, I will no longer tolerate this absurdity we call a football team and will become a fan of another team. A fan for 31 years, and they have made me consider giving it all up. I have never considered not being a Browns fan in my life until this past Friday. I have been stupidly giving thousands of dollars away to a team that seems to have a mission to make it harder and harder to do so. There is really no reason I can find anymore to shell out hard-earned cash to attend the games in person. The atmosphere has been subdued, the food and beer is incredibly overpriced, you can’t get cellular service at the stadium, and there is little to no information about other games (or stats about the game that is happening right in front of you) displayed in stadium. And oh yeah, god forbid you do something crazy like standing up and cheering. I still cannot believe this happened and keep thinking there must be more to it, but having been involved, I can assure you, it was simply just standing. So to the ‘fan’ in section 121 that was so eager to kick us out, please how about you stay home for the rest of the season and let real fans show our support for Browns. A ticket rep from the Browns has reached out to Jim to hear his side of the story. The person reaching out to him was not a supervisor and also told Jim they normally do not kick people out for standing, and sounded to be skeptical of the story. No apology was given.